Shao Hsing Hua Diao Jiu (紹興花雕酒) – a type of rice wine originated from Shao Xing, China. It is mainly made of glutinous rice and wheat. Alcohol content by volume: 16% or less. Its name, Hua Diao describes the flowery carved pottery that stored the wine anciently, but the bottle has been mass produced commercially with simpler design in handy bottle, for convenience and more economical purposes. However, there are still many Hua Diao Wine selling in nice flowery carving designed pottery. Seriously, it does not matter how it is bottled to me, all I care is the quality of wine and its taste added to my cooking. There are different grades of such wine, for different purposes of drinking and cooking. It resembles the taste of dry sherry. The aroma of this Hua Diao wine is vary, depends on its grade and how much it priced. To my knowledge, those available in most supermarkets and sundry shops, ranged from $2 for a big bottle (lower grade) to $15 for only a small bottle (better grade). The one that I am using costs $9 for a bottle of 380ml. A 5 year vintage wine from Plum Blossom brand (梅花牌). Its quality and fragrance should be great enough for prefect home cooking. Of course, I like this brand, reason being it does not contain any salt! 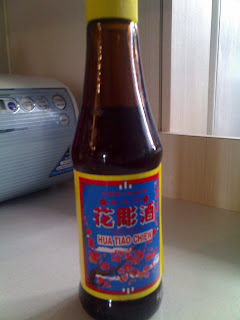 I love to use Hua Diao wine to many of my cooking due to its sweet and pleasant aroma added to my dishes, for instances, fried rice, fried bee hoon, steamed fish, prawns, mushrooms dishes, broccolis, soup, and many more! It has become a staple condiment in my kitchen. Next time when you cook such dishes, try to drizzle some Hua Diao Wine! Just mt recommendation, to share with you. Hi Patricia – do u know if we could also use this wine to cook the chinese drunken chicken that they usually would give to women that just have a natural childbirth to recover the lost blood? Add it towards the end, or your chicken will become less wine taste. Is it suitable to use this wine in meals that are also consume by children? My girl aged 7 drinks my soup or dishes with tablespoon of this rice wine so far. To me, as long as the dish is cooked long enough for the alcohol to evaporate, leaving some concentrated flavor of the wine, it is OK to be consumed by children. I agree with what you wrote. My kids also eat food that is cooked with rice wine, no problems at all. They are still healthy. I agree with what you wrote abt kids eating food cooked with wine. My kids 7 and 9 hv eaten food with cooked with mirin and rice wine. No problems with their health. Is Hua Diao Wine the same as Rice Wine. I think they are different right? Hua diao is a type of rice wine, too. And more well known one will be from Shao Hsing province. HI Shermaine where can I purchase this Plum Blossom Brand wine that you recommend? Plum Blossom brand is widely available at major supermarkets and some large scale provision shops. Look at cooking wine cells. Yes, but long expiration date usually.